MediaPOINTE’s revolutionary new HD Portal is already the most powerful, affordable and easy to use eLearning solution on the market today. But now, it is also the most portable. 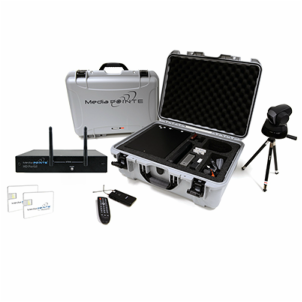 With the HD Portal – Portable System Kit, you get all of the necessary components to capture and stream any live event, anytime … anywhere! Everything from power to cabling has been streamlined for quick and easy setup in just minutes. And MediaPOINTE’s patented Wi Fi Hub technology allows you to Control, Monitor and Stream your content wirelessly. No need for a network connection or IT staff to get you up and running. The system will even upload and publish your content to websites … Wirelessly and AUTOMATICALLY. Best of all, the entire system fits neatly into a shockproof, weatherproof carrying case that is only about 20 lbs and barely bigger than a briefcase. Now you can capture EVERY even – EVERY time without having to invest in a separate system for EVERY room.